Lace enthusiasts the world over recognise the name of the Idrija Lace School and the distinctive traditional work that emanates from it. Bridget M Cook, a leading authority on lace making and Metka Tratnik, a senior instructor at the Idrija Lace School, have created this book of Idrija lace patterns. Full instructions are given, complete with prickings and international colour coded diagrams. The patterns are progressively structured to add new techniques and build confidence so that, by the end of the book, thrilling patterns will be in the reader's grasp. The book will appeal to students and lacemakers requiring a new challenge to fulfil their interest in the craft, and offers the unique satisfaction of mastering a new set of skills with a long tradition. Bridget M Cook is a prize-winning British lacemaker, teacher and designer, whose work is known from exhibitions demonstrations and lectures around the world. In 1983 she was awarded a Churchill Trust travelling fellowship to undertake research in the methods of lacemaking across Europe. She is the author of many books on lacemaking. Metka Tratnik is the head lace teacher at the idrija School of Lace in Slovenia. She attended the Idrija primary school and learnt lacemaking in her free time-but then went on to secondary school in Tolmin before qualifying as a professional teacher of the University of Ljubljana. 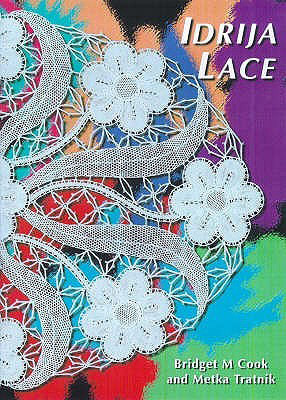 She returned to Idrija and took a special Lace course before joining the full-time staff of the Idrija School of lace. If you wish to purchase this Idrija Lace book, please email info@bridgetmcook.uk, including your name, full postal and email address. An invoice will then be emailed to you via PayPal. Once payment has been received, the book will be dispatched to you. Alternatively you can purchase via eBay by bobbinbridget.